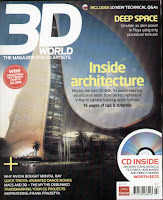 This months 3D World Magazine (March 2008) is an essential purchase – it features 16 pages of tips and tutorials for architectural visualisation. Highlights include a tutorial on inserting 3D models into a video clip using Boujou Bullet and techniques for mastering compositing in a New York street scene. It should be available in all good newsagents as we type..
More at the 3D World Website (note the previous issue is still featured on the site).